I don’t think there’s a better weeknight protein than salmon. Healthy, tasty, and easy, plus it makes great leftovers in a salad. I prefer to buy a side of salmon, as it’s usually a good bit cheaper and grills (or bakes) nicely, especially if you’re a fan of crispy salmon skin. 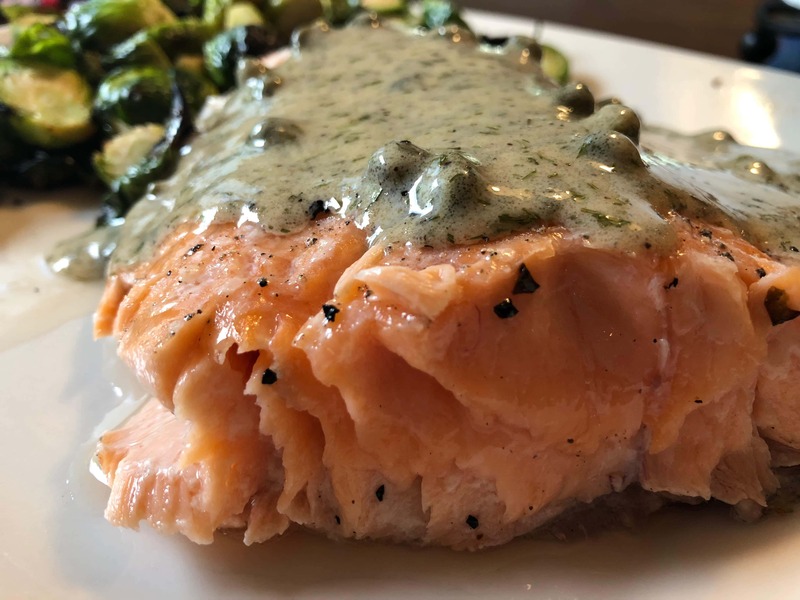 Pair with a simple salad or grilled veggies (Brussels sprouts and broccoli work great with this mustard forward sauce) and crush your weeknight meal. Turn grill to medium high heat or oven to 400 deg F.
Combine juice of 1 and 1/2 lemons, mustard, dill, capers, and brine. Slowly whisk in olive oil to emulsify. Season with pepper and a light amount of salt. Cut remaining half lemon into small slices. Tear sheet of aluminum foil big enough for the salmon, plus a few inches. Lightly oil and place salmon on foil, skin down. Season salmon with salt and pepper. Top with lemon slices. Remove from heat, let rest for a few minutes. Serve warm, topped with caper dill sauce. **Don’t skip this step. Most places do a really nice job, but one can sneak through.